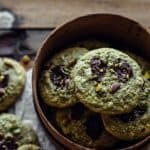 Soft and chewy Chocolate Pistachio Cookies are easy to make and loaded with pistachio and chocolate taste. No artificial colors! Just 11 ingredients and 10 minutes of active prep time. Who doesn’t love good old chocolate chip cookies? 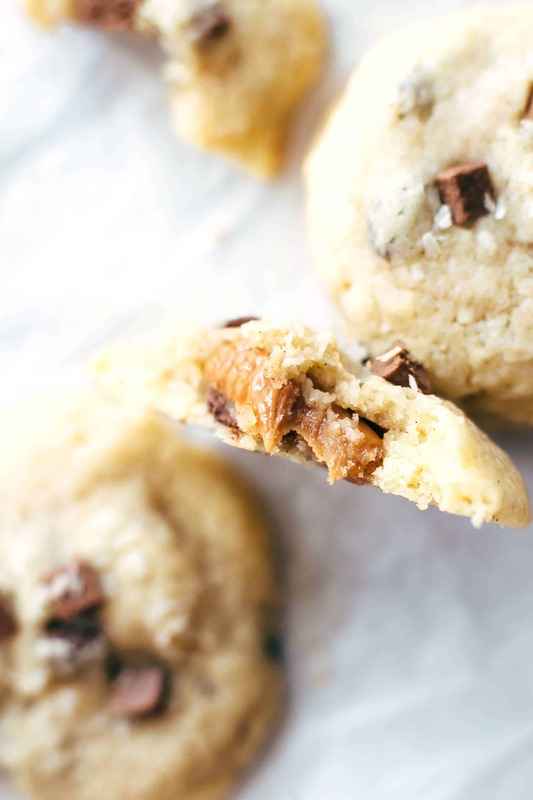 That chewy and soft texture is absolutely drool-worthy. 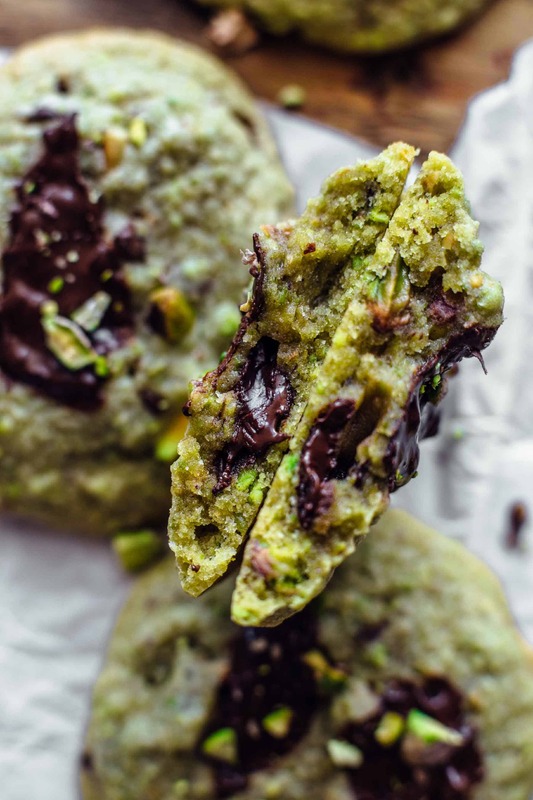 What about Chocolate Pistachio Cookies? When thinking of pistachio cookies, I generally have a picture of Christmas cookies in my mind. Maybe with a soft texture but not chewy. Maybe with a crunch. 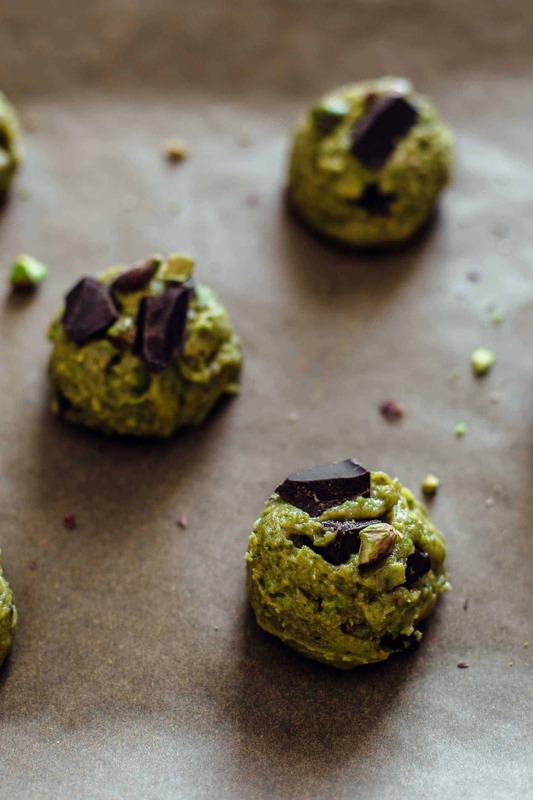 These are delicious but because it’s not Christmas and I craved pistachio very bad I decided to create a soft and chewy chocolate-chip-cookies kind of cookie. Soft and chewy, chewy, chewy! Tell me in the comments below. I would like to know who is the winner! Although I’m a little cookie monster and love all cookies, my favorites are soft and chewy ones. 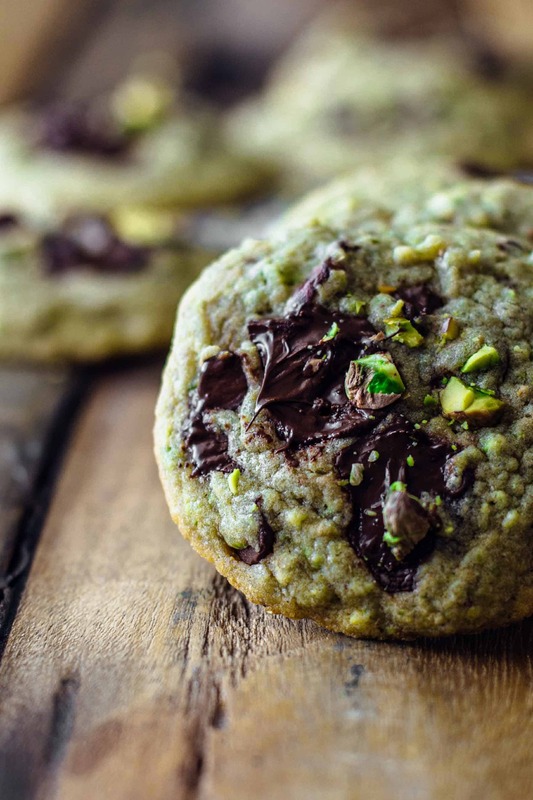 If you are a pistachio fan, these Chocolate Pistachio Cookies are going to be your new favorite cookies! Do you see that green color? This is just from the pistachio, no artificial color involved. Promised! Speaking of Christmas. Can you believe that Christmas is here in less than 13 weeks? I already see all the gingerbread men, sugar canes, and sugar cookies in front of my inner eye. The time between summer and Christmas is just magical. We have a colorful fall, lots of holidays like Halloween (my personal favorite), Thanksgiving, Black Friday (no that’s my favorite >>> SHOPPING!!! ), advent, and all the pre-Christmas fun. And then Christmas is here and we like: “WHAAAAT? It’s already Christmas? But I don’t have all the presents yet…” What a surprise. Like every year, right? Or is it just me to be so unorganized and unplanned when it comes to Christmas presents? Ok, enough Christmas talk at the end of September. Let’s slow down a bit. 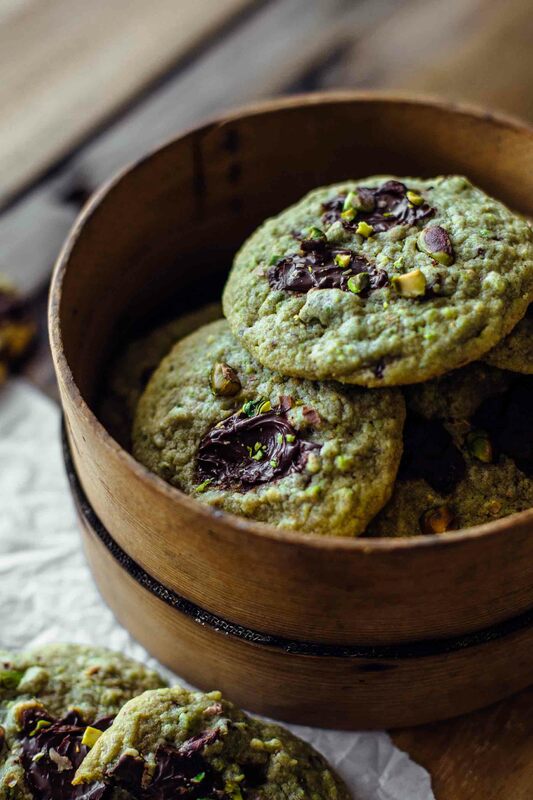 Before all this crazy but exciting and fun season starts, we have enough time to enjoy these Chocolate Pistachio Cookies. There are some factors which lead to super soft and chewy Chocolate Pistachio Cookies as following (not complete list!). I always melt the butter by 2/3 in the microwave and stir until fully melted. Melting the butter in the microwave is easy and takes you about 1 minute depending on the power of your microwave. Because the butter is not completely melted when taken out of the microwave, you don’t overheat it. It shouldn’t be hot when mixed with all the other ingredients. So melt by 2/3 as I said before, then stir until fully combined and then the butter has the right temperature and consistency. It should be completely liquid but dull and not look-through. Melted butter lets the cookies more spread during the baking compared to cold or soft butter. Generally, it can be said that white sugar lets cookies more spread what leads to a thinner cookie and brown sugar keeps a cookie more compact. Brown sugar also adds more caramel-ish and a deeper flavor to a cookie. For a regular chocolate chip cookie, I love to go with more brown sugar than white sugar because I don’t want that the cookies spread too much and get too thin. 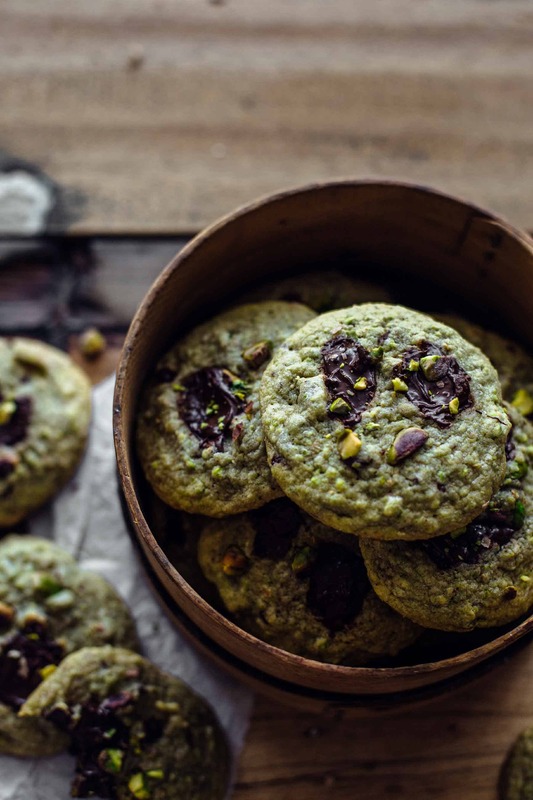 With these Chocolate Pistachio Cookies, it’s a bit different. Because the half of the flour is replaced by ground pistachio, the cookies don’t spread too much anyway. And that the cookies don’t stay too thick, I decided to add more white sugar than brown sugar that they spread more. They stay about 1/2 inch thick AND are super chewy. Cookies which need to be chilled before baking have less dry ingredients, and they would literally melt down while baking. So they need to be chilled that you don’t have one large baking sheet sized cookie, you know what I’m saying? It’s also possible that cookies with required chilling time have the same dry/wet ingredient ratio than cookies which don’t call for a chill time. In this case, the cookies are supposed to stay super thick and shouldn’t spread much. 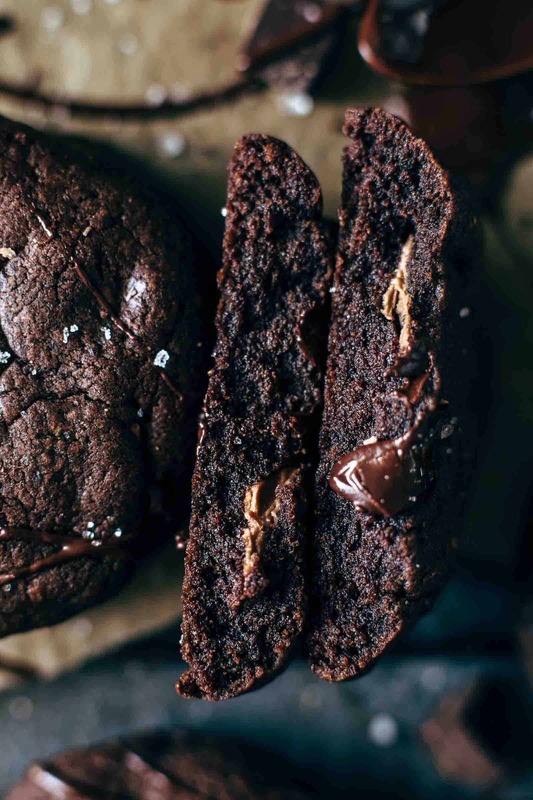 Cookies with a higher dry ingredient amount can be baked without chilling time, depending on your cookie goal (thick, thin, crispy, chewy, cakey,…). 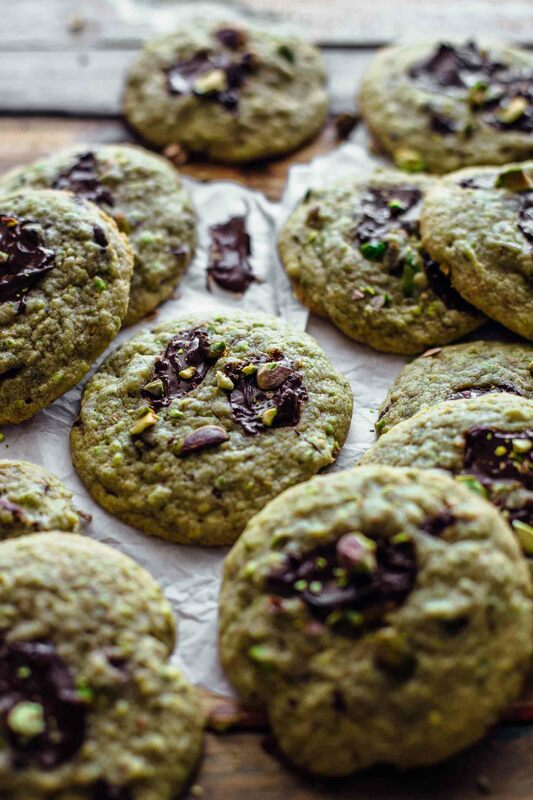 These Chocolate Pistachio Cookies don’t need to be chilled. Just prepare the cookie dough, then scoop balls of cookie dough onto a parchment paper layered baking sheet and bake them. Easy peasy and super quick. Although this is not a full list of all the cookie texture science, you have now a good understanding of how to have an impact on your cookies texture. Speaking of Christmas again. Replace the dark chocolate with crushed peppermint sugar canes and these would be the perfect Christmas cookies. Or try dried cranberries and white chocolate. YUM! 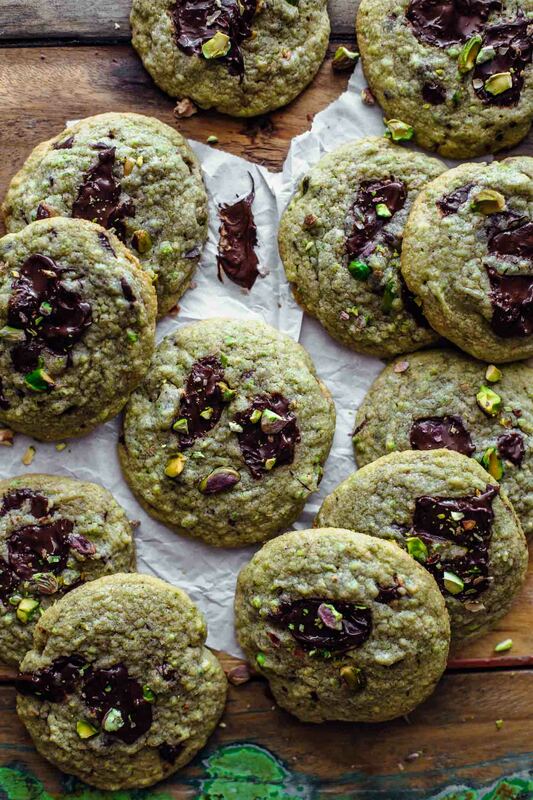 If you make this Chocolate Pistachio Cookies recipe, leave a comment, rate it and tag a photo #alsothecrumbsplease on Instagram! Would love to see your snap! 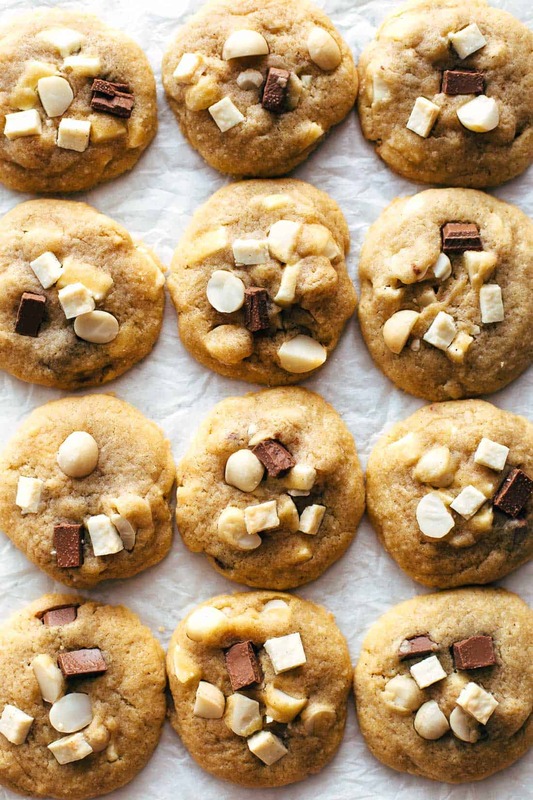 You may also like Peanut Butter Chocolate Cookies, Super Fudgy Chocolate Brownie Cookies, Best ever Chocolate Macadamia Cookies, Coconut Caramel Chocolate Chip Cookies, or click here to see all recipes. Preheat oven to 350°F (175°C). Line 2 baking sheets with parchment paper. Set aside. In a large mixing bowl, using a handheld or stand mixer fitted with a paddle or whisk attachment, stir butter and sugars on medium speed just until combined about 1 minute. Add egg and vanilla and stir to combine. 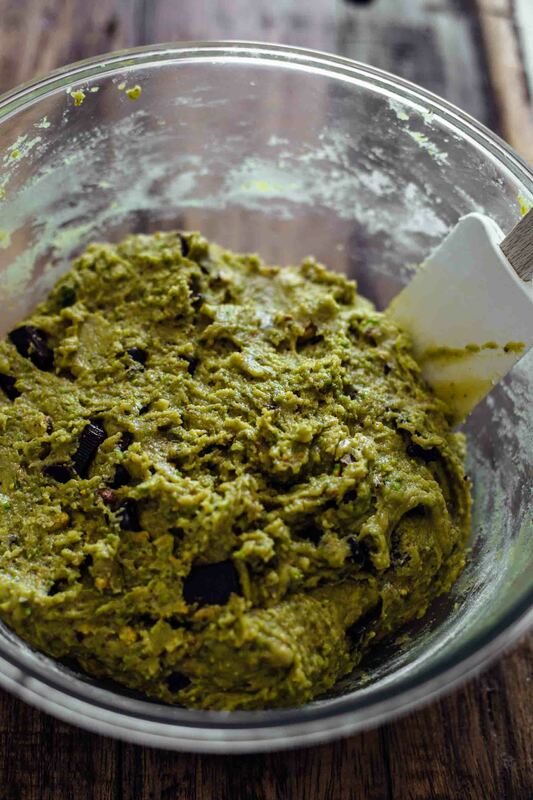 Stir in flour, ground pistachio, baking powder, and salt just until combined. Fold in chocolate and chopped pistachio. Don't overmix at any step. Scoop balls of cookie dough and arrange 6 cookies on one baking sheet with about 2-3 inches space in-between. Make sure that you get 12 evenly sized cookies, using a kitchen scale and divide the batter through 12 is the most accurate method. Bake one sheet after another for about 10-11 minutes. Remove from oven when they look puffy and dry on top. Let cool for about 5 minutes until they get firm enough to move them. Then transfer the cookies to a cooling rack and let cool completely. The cookies will stay fresh in an airtight container at room temperature up to 4 days. 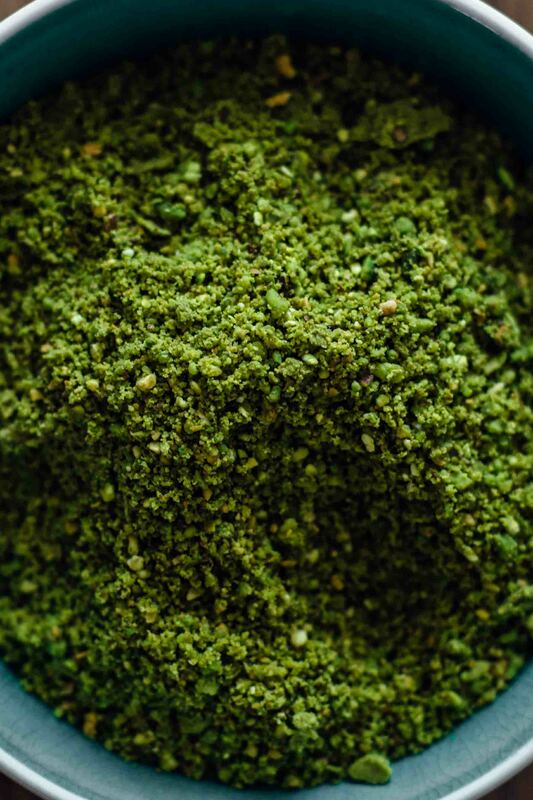 This comment is coming from a completely uneducated baker–so no offense to any of your other baker fans out there–but you, Ms. Sabine, are the first person I ever came across who used ACTUAL ground pistachios in baking. In America, we have Jell-O Instant Pistachio pudding dry mix and that is the only thing I have seen used in desserts (other than a sprinkling of the nuts on top for texture.) I commend you for such a stellar recipe. I bet these taste above and beyond any artificial ingredients. I love pistachio! I don’t know if you have ice cream or custard pistachio, but that is divine too. I hope you are doing well, Sabine. I know most of your followers comment on Instagram rather than here on the blog, so maybe I am safer here admitting to my complete lack of knowledge on baking. 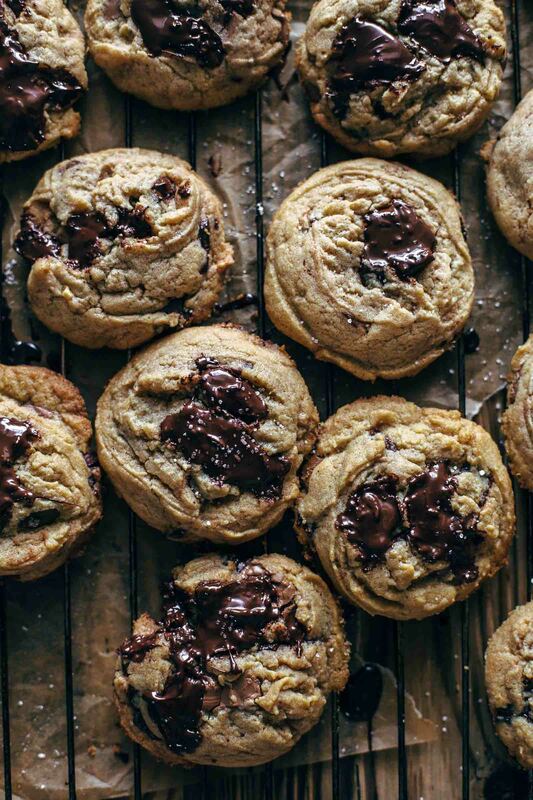 Your “cookie science” lessons are worth reading over and over again. Oh my. I am sorry for rambling, but one last thing: your Apple Cake a couple of posts back was so AMAZING. That is another thing only YOU could create. I just shook my head and said, “this girl is so out of my league! I will just admire from afar.” Take care, Sabine. Hi thank you the recipe, I tried it and it turned out great but the balls didn’t spread with me while baking,why?, I followed the steps exactly as you recommend. 1. Too much of dry ingredients in the dough: Please make sure to spoon and level the flour in the measuring cup. A packed cup of flour is 1.5x of spooned and leveled flour. The more flour the drier the cookies. The best would be to use a kitchen scale. 2. Too little of wet ingredients: Did you use a large egg? 3. Butter quality. I made the experience that low budget butter leads to dry cookies which don’t spread. Always use high-quality butter for cookies. 4. Overmixing. Mix just until combined at every step. Overmixing can lead to cakey and dry cookies. Did you watch the video? Did your cookie dough look like mine? It should be slightly sticky to touch before baking. If it looked like mine than it could be that the oven temperature is not accurate. I always use an oven thermometer because my oven is not accurate. Last but not least: Cookies baked on a silicon mat don’t spread as much as on parchment paper.